The Blue Ridge Mountains of North Carolina are full of artists and craftspeople of all kinds. Whether it's the stunning views or the ideal climate, these mountains seem to attract creative individuals. From musicians to painters to those who specialize in traditional Appalachian arts and crafts, you'll find no shortage of artistry in this region. Many people peruse the shops and boutiques of local artists during their trips and purchase home décor, antiques, or other types of trinkets to commemorate their visits to the High Country, but if you want a souvenir that will serve as a constant reminder of your trip, consider investing in a piece of our Artisan Gemstone Jewelry. The truly Unique Gemstone Jewelry we create in our NC Jewelry Store is fashioned with the Gem Stones North Carolina that are found at our gem mine, just steps away from where we do our work. Our Designer Inspired Gemstone Jewelry is different from anything you'll find anywhere else, and we guarantee that you won't run into anyone who is wearing the same piece as you. Whether you're searching for Custom Handmade Jewelry Earrings, a Custom Faceted Fine Gemstone Necklace, or any other piece of Designer Gemstone Jewelry, chances are we have something that will suit you perfectly. 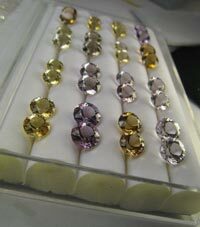 Each piece of Colored Gemstone Jewelry we produce is a work of art in and of itself. We utilize our Lapidary Equipment and Faceting Supplies to turn the stones we work with into some of the most beautiful specimens in the business. Our Faceting Machine allows us to embellish a gemstone's natural capacity to catch and reflect light, thereby adding to the beauty that nature has already given it. Once we've worked our faceting magic on the North Carolina Gemstones, we set them in exquisite handmade settings of sterling silver, platinum, and 14kt yellow and white gold. As Custom Jewelry Designers, we take pride in the work we do. Since each piece is an original work of art, a great deal of thought goes into the design of all of our Semi Precious Stones Jewelry, and this attention to detail is what makes each piece of our Custom Design Jewelry so extraordinary. To learn more about Gem Stones North Carolina and the Custom Fine Jewelry we create with them, browse our site. Our helpful Gem Stones Guide is full of interesting information about the different kinds of stones we work with, and you can search our online display for whatever type of jewelry your heart desires. Whether you're in the market for a Custom Faceted Gemstone Necklace or that perfect pair of Custom Handmade Jewelry Earrings, Facets of Foscoe has something that will strike your fancy. We invite you to contact us today to learn more about the services we provide, and we hope that you'll stop by our NC Jewelry Store next time you're in the area!